Likes: Tikka-ised starter. Curries that are not too aggressive, maybe with a bit of nice spinach, with lamb, beef or chicken. Anything garlic. Spacious eateries that can cope with his foolish over-ordering of side dishes. Side dishes. Dislikes: Kormas, obviously. None of your seafood nonsense. Narrow tables with no room to slump or avoid playing footsie with JNo. Any menu handed to you with the greeting “choose your weapon”. Small beers. Dislikes: Anything that isn't a chicken bhuna. Preferred beverage: A proper pint of bitter, lad, and make it sharpish. Likes: Sizzlers. Prawn curries. Naan bread. Town centre curry houses (especially Akbar's). Dislikes: Rice. Super spicy curries. Generic Rusholme curry houses. Garlic naans that are like garlic bread. Preferred beverage: Pint of lager. Likes: Curries (especially sizzlers). 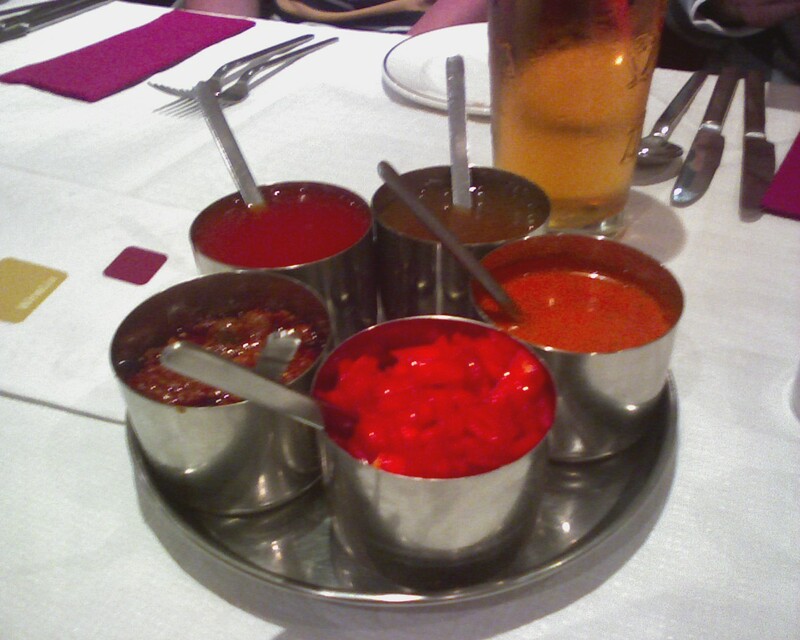 Attending Curry Nights (an exemplary attendance record, until retiring anyway). Dislikes: Dirty women's toilets. Dry naan bread. Getting hammered on a school night. Preferred beverage: Maybe a small alcoholic drink then stick to coke. Likes: The Scottish burr. Free shots. Getting out of the house. Dislikes: Old/dirty vaginas. Poor service. Lack of baby changing facilities. Waiters shouting out orders when the food is ready. Preferred beverage: Lager (alcohol-free if the situation dictates). Likes: Curries. Large portions. Akbar's. Dislikes: People stealing her beer. Smokers. Likes: Sizzlers. Cider on draught. Chicken dhansak. Dislikes: A lack of cider. Overly spicy curries. Preferred beverage: Pint of cider. Likes: Efficient service. Good décor. Dislikes: Practical jokes involving rubber chicken. Stingy portion sizes. Likes: Good service. Sweets. Value for money. Dislikes: Alcohol. Pushy waiters. Sauceless curries. Likes: Being a proper reviewer. No chillies. Rusholme curry houses with their neon signs, dubious décor and laminated menus. Huge naans on sticks. Omelettes. Dislikes: Too much ginger. More than no chillies. Subjecting people to the uncontrollable reaction of his digestive system to anything remotely spicy. Anything remotely spicy. Likes: The spiciest thing on the menu. Strong lager. Free ice cream. Poetry. Dislikes: Tame curries. Non-alcoholic Cobra. Melting eyeballs. Cheap naans. Likes: Curries. Tracking the time taken to bring out each course. Biscuits. Nice things. Non-alcoholic drinks (these days). Dislikes: Beer (these days). Insufficient poppadom numbers. Late arrival of food. Second guessing dishes based on number orders. Preferred beverage: Coke (these days). Likes: Kormas. Spacious dining facilities. Socialising before and after the meal. Dislikes: Spicy curries. Ridicule for ordering kormas. Cramped locations. Likes: Chicken karahi. Watching others have their starters cut up. Dislikes: Ridiculous waits for food. Bollywood Masala. Sparkling pomegranate drinks. Preferred beverage: Water (usually driving these days). But sometimes lager (when not driving, obviously). Likes: High quality, good value food. Good company. More than three dips. Dislikes: Inattentive staff. Meat on the bone. McDonalds Happy Meals in a curry house. Preferred beverage: Lager, preferably one that no-one else is drinking. Or red wine. Or Coca Cola.